While bread pudding was originally developed to make use of stale bread, it has evolved into its own creamy, crunchy, delicious dessert and is now a much-loved Southern tradition — especially to Cajun and Creole people. The ingredient list is long as it uses several spices, but this is a simple recipe to make. Serve with a dollop of whipped cream, then drizzle whiskey sauce over pudding and cream. Preheat the oven to 350 F. Grease a 9 x 13-inch pan with the 1 tablespoon butter. Toast the pecans in a dry frying pan over medium heat for 5 to 10 minutes, or until fragrant (don't allow pecans to burn). Remove from the heat. Whisk together the eggs, sugar, vanilla, cinnamon, nutmeg, melted butter and milk until well blended. Place half the bread cubes in the buttered dish, top with the chopped pecans, then pour half the liquid mixture over the bread. Add the remaining bread cubes and top with remaining liquid. Cover with plastic wrap and let set for 30 minutes, gently pressing the cubes underneath the liquid a few times to make sure the bread is moistened. Remove plastic, cover with foil and bake in preheated oven for 45 minutes. Uncover the pudding, drizzle 1 cup of the warm Whiskey Vanilla Sauce over it, and bake for an additional 5 minutes, uncovered. Let set for at least 5 minutes before cutting. Serve the remaining Whiskey Vanilla Sauce with the pudding. While pudding is baking, combine the sugar, cream, spices, and butter in a small saucepan and bring to a gentle boil. When the butter is melted, combine the whiskey, cornstarch, and vanilla in a small bowl, then slowly whisk the whiskey mixture into the gently boiling sauce. Boil gently for 5 minutes, stirring often. To serve, dish up the hot pudding, place a dollop of whipped cream on top, and drizzle with some of the Whiskey Vanilla Sauce. 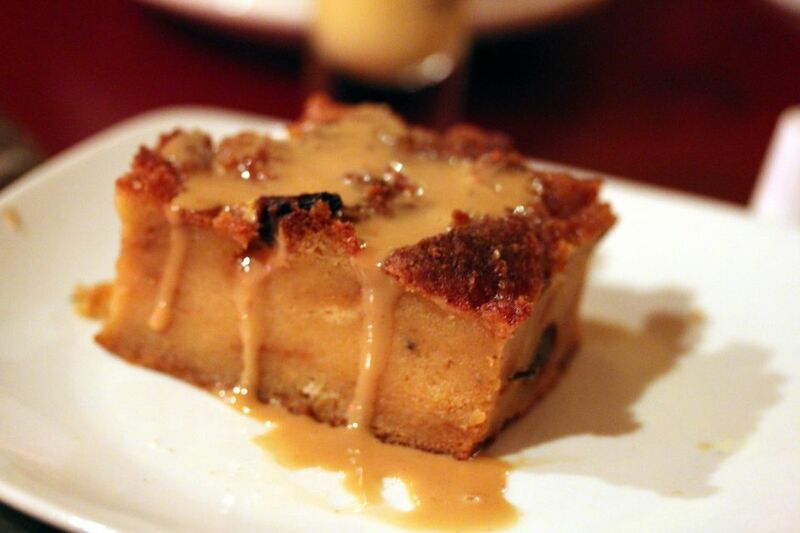 Bread pudding may be made with any type of unseasoned, leftover bread. Unseasoned meaning not garlic, cheese, rye, or other flavored savory bread.